‘젊은국악오디션 단장’은 지난해 서울시와 제과전문그룹 크라운해태간 체결된 ‘남산국악당 활성화를 위한 업무 협약’에 따라 추진된 청년국악 육성지원사업으로 경쟁력 있는 국악인 발굴과 육성, 활동 지원을 패키지화한 프로그램이다. 서울남산국악당은 올해 2월 청년국악오디션 단장 사업계획에 앞서 지난 10여년간 국공립 및 민간에서 추진되던 각종 청년국악 인큐베이팅 사업의 담당자들과 함께 그간의 성과를 돌아보며, 새로운 청년국악사업에 대한 조언을 듣는 시간을 마련하기도 하였다. 디제잉과 화려한 안무로 펼쳐지는 궁예찬 쇼! 관객들의 오감을 만족시키는 쇼가 될 것 이다. 관객과 함께 뛰어놀고 싶은 궁예찬의 마음이 전해지길 바라며, 지금부터 쇼타임! DJing and a splendid choreography show! by arranging Korean folk songs into club styles and mixing the songs of Blackstring and Jambinai in the style of Goong Yechan. Goong Yechan wants to run and play with the audience in the performance. Show time from now on! 7. Ongheya What should I do? 웃음과 행복을 주기 위한 공연을 만드는 단체이다. crossing borders of acting and magic, and a play and a show. Our group makes performances to give you smiles and happiness. 상상의 기회를 제공하는 것', 이것이 넋넋이 추구하는 음악이다. ‘Knock Knock’ pursues music that will offer a place for imagination to our audience by producing scenes with acoustic guitar, haegeum, and jangdan. 1. 새벽의 숲 : 태양이 나뭇잎 사이로 비춰오고 그 안에서 작은 풀벌레 소리가 들린다. 루프스테이션을 활용한 기타의 사운드와 해금의 ‘영산회상’ 이 함께 잘 어우러진 곡이다. 2. 추수하는 사람들 : 노랗게 익은 벼 사이로 사람들은 노동요를 부르며, 즐거운 얼굴로 추수를 하고 있다. 징의 신나는 리듬과 기타와 해금의 멜로디로 풍년 속에서 즐겁게 추수 하는 사람들의 마음을 담았다. 3. 바다 위의 노을 : 바다 위의 뜨겁게 타오른 해가 점점 사라져 간다. 해변에 앉아 그것을 지켜본다. 지영희류 해금산조 중 ‘진양조’ 에 기타의 화성과 다양한 주법을 더하여 더욱 입체적으로 표현했다. 4. 다시, 숲 : 을씨년스러운 바람이 분다. 흔들리는 나뭇잎은 스산한 기운을 풍긴다. 정악 가야금의 ‘상령산’ 연주와 함께, 기타의 독특한 사운드가 어울어져 음산한 분위기를 만들었다. 1. Forest at Dawn : Sun ray shines upon leaves, and sound of small bugs can be heard. This song is a harmonious mixture of guitar sound using a loop station and ‘yeongsan hoesang’ played by haegeum. 2. The Harvesters : Behind well-ripened golden rice plants, people are singing a labor song and joyfully harvesting. Jing’s upbeat rhythm and guitar and haegeum’s melody represent hearts of the people towards the good harvest. 3. Sunset above Ocean : The scorching sun above the ocean gradually disappears. We sit on the beach watching the process. In addition to ‘jinahnjo’ from Ji Younghee-ryu haegeum sanjo, the song is expressed more dynamically with guitar’s chords and various playing styles. 4. Again, the Forest : Dreary wind is blowing. Shaking leaves give off a spooky mood. ‘Sangryeongsan’ played by jeongak gayageum and guitar’s unique sound meet and create the gloomy mood of the song. MuRR(뮤르)는 국악기를 기반으로 다양한 장르의 음악을 시도하는 여성 3인조 국악 창작 그룹이다. 이 시대의 공감대는 무엇인지 끊임없이 고민하며 뮤르만의 색깔로 대중들과 소통하고 있다. 특히 한 달에 한번 새로운 곡을 창작하여 디지털 싱글로 발매하는 프로젝트를 통해 ‘전통, 시김새(전통음악에서 선율을 이루는 골격음의 앞이나 뒤에서 그 음을 꾸며주는 장식음을 일컫는 용어)나 성음(음질이나 음색에 가까운 개념)’ 뿐만 아니라 음악의 즐거움을 추구하며 모두가 즐길 수 있는 음악을 만들어가고 있다. MuRR is a female trio and a creative gukak group which experiments with various music genres using Korean traditional instruments. Endlessly contemplating on what is needed to be connected to today’s generation, MuRR communicates with the public with its unique color. Especially through their project of creating a new song and releasing a digital single every month, they are making music where not only ‘tradition, sigimsae(a term referring to an embellishing note which appears before or after a target note on melody line in Korean traditional music), or seongum(similar concept to sound quality or tone)’ but also joy of music are pursued, creating music that everyone can enjoy. 1. 풍년가 : 민요 풍년가를 모티브로 만든 뮤르의 新풍년가. 2. Wind Swing : ‘Swing (스윙)’의 의미 그대로 연주하는 이, 듣는 이 모두 몸을 가볍게 흔들며 즐길 수 있는 곡이다. 피아노와 카혼의 반주에 대피리와 생황이 만나 자유로운 선율을 연주하며 뮤르의 스윙음악을 연주한다. 3. 가리봉블루스 : 이야기로 전해들은 가리봉동의 70~80년대는 기회의 도시, 활기찬 도시, 누구나 머물고 함께하고 싶은 도시였다. 그러한 예전의 가리봉동의 이미지를 그린 음악이다. 4. 두 번째 외출 : 꿈과 희망을 찾아 열심히 살아가는 우리네 모습을 노래로 만들었다. 5. See You in New York : 뉴욕의 담배연기 자욱한 클럽에서 진한 대피리의 멜로디가 울려퍼지는 모습을 상상한다. 어디서든 독창적이며 이질적이지 않는 뮤르의 음악 색깔을 보여준다. 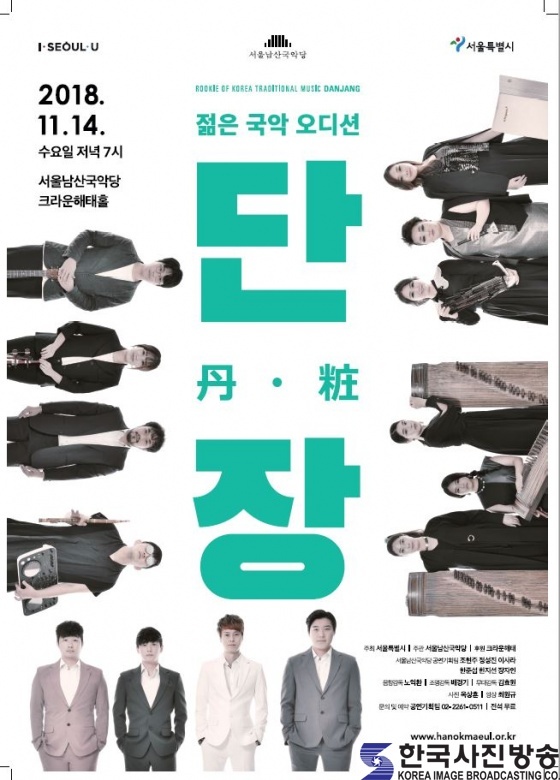 About: Dal Dal Concert is a gukak(Korean traditional music) concert with songs that will allow gukak become more familiar to the public. 2. Wind Swing: As implied in the title ‘Swing’, it is a song where both performers and audience can enjoy by lightly swinging their bodies. Accompanied by piano and cajon, daepiri and saenghwang freely play melody of MuRR’s swing music. 3. Garibong-dong Blues : It is said that Garibong-dong was once a city with opportunities and vivacity where everyone wanted to take part in during 70-80’s. This song depicts such old image of Garibong-dong. 4. Going Out for the Second Time : This song shows our own selves living life vigorously, searching for dream and hope. 5. See You in New York : Daepiri’s deep melody resounding across a club full of cigarette smoke in New York can be imagined. It shows MuRR’s distinct color in music, which is creative and blends in anywhere. 3인의 가야금 연주자로 구성된 헤이스트링은 악기의 한계를 뛰어넘는 가능성을 모색해 가는 음악집단이다. 실험적 시도를 신선한 소리와 음악의 다양성을 창출하여 장르를 뛰어넘는 독창적인 가야금 앙상블을 지향한다. 직접 창작 및 편곡활동을 하고 있으며 제 11회 21C한국음악프로젝트 은상을 수상하며 이름을 알렸다. A trio of gayageum instrumentalists, Hey String, is a musical group that seeks to overcome limits of instruments. They offer a unique style of gayageum ensemble that crisscrosses genres by creating musical variations and fresh sound by experimentations. They compose and arrange their own music and became known after receiving the second place at the 11th21cKoreanMusicProject. 1. 켜켜이 쌓인 발자국 : 드넓게 펼쳐진 설원 위에 조화롭게 같이 걸어가는 발자국들로부터 영감을 받아 탄생한 작품이다. 2. A Bottomless Pit : 바다는 인간이 베일을 온전히 벗기지 못한 미지의 세계이다. 무한한 가능성을 가진 신비롭지만 두려운 그 곳, 깊은 바다에 대한 상상을 담아낸 작품이다. 3. Potencia ; 불확실한 미래에 대한 고민들이 잠재된 감수성을 통해 하나의 음악으로 발산되는 것을 표현한다. 다채롭게 변주하는 가야금 선율 위에 플라멩코의 'Compas(장단)'과 'Palma(손뼉리듬)'을 사용했다. 1. This project has been inspired by layers of footsteps and footsteps marked harmoniously on snow-covered, wide field. 2. A bottomless pit :Ocean is a mysterious world where humans have failed to uncover its veil completely. The strange and spooky place with infinite possibility. The song portrays our imagination of the deep ocean. 3. Potencia: Unsettling thoughts on uncertain future is expressed in a form of music through subconscious sensitivity. Variations of gayageum tune are accompanied with flamenco’s ‘Compas(rhythm)’ and ‘Palma(clapping beats)’.